Jimmy McGill: [knock on door] Mrs. Landry, you're looking lovely as ever. Irene Landry: Jimmy McGill! What are you doing here? Jimmy McGill: Oh, I was in the area, and I thought, I wonder how my favorite former client is doing? And I have cookies. Irene Landry: [chuckling] Oh, you're so sweet. Come on in! Jimmy McGill: I looked down, and I thought, "Wow! That looks just like your Felix." Play on Player, play on! Said it before, will say it again, this is not Breaking Bad! The pace is a bit slower and the content different. However, we get the brilliance of Vince Gilligan and his team on display with cutting edge storytelling. Like any great artist, with a few notes of a song, you know the talent. Gillian has as a distinct style as the Cohen Bro's, and that is very impressive! This episode ties so many small parts together seamlessly. The casting is stellar. Take for example Jean Effron who plays Irene. Her IMDb resume is almost blank. How did they find her? She has done basically nothing...and that is the risk that pays off so well. She does not seem like an actor. I really believe this is a little old lady living in a retirement home who likes to take walks at the mall with her girlfriends. The actors that surround her have been around for awhile, one of which was on Little House on the Prairie. This is the shift today in film making, to not go with the seasoned character actor first. Another great selection is Rhea Seehorn playing Kim. She plays this role so understated, never capitulating to 'more'...if she was a drummer, her style would be 'less is more'. There are so many moments she could have thrown in more 'chops' but she doesn't. Great directing here, but this makes BCS so mature and satisfying. In this episode, what other writer would throw in a scene where she gets stuck in the dirt to develop more character depth and reality? It comes out of nowhere. Brilliant. Satisfying! 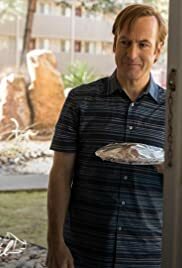 Better Call Saul is a full album over a hit single! You have to soak in the entire context. Watch season one over and so on...the flow is seamless with the old and the new. This is ground breaking storytelling. What other TV show has risked blending a former hit series into a new without trying to be, "Joanie Loves Chachi?" Frasier is the only other that has done this so well imo. I could go on about the casting. This is an orchestra playing with a lead instrument! This is a TV show similar to Michael Clayton. It builds, does not have to rely on special effects and action to communicate depth, just relies on great storytelling and allows the characters to speak loudly.